I love the burst of tartness when you bite into a piece of cranberry in this bread! The recipe comes from Taste of Home. Unlike most quick breads, this one uses a very low amount of oil, making it a healthier choice! Don't be alarmed when the dough is rather stiff when you mix it up. 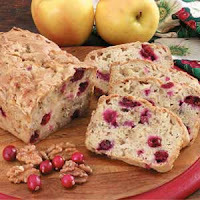 The fresh apples and cranberries give off a lot of moisture when the bread is baked. I loved this recipe- just tried it the other day. I can't have eggs right now either, so I found that you can substitute applesauce and that worked great! Delicious!